Nothing makes your home look more beautiful than a vibrant, green lawn. However, maintaining the perfect lawn is not easy to do. Follow some of the below tricks to ensure that you have dense, green grass. There are a number of different types of grass seed, so you need to determine which will work best for you. Consider the amount of shade in your yard, the time of year, and the elevation to find out what will work for your lawn. If you aren’t sure which seed type would be best, even after you have answered these questions, ask an associate to help you pick which you need. Not all seeds will work for your specific situation. Test your soil to see how balanced the nutrients are and if you need to buy fertilizer with additional nutrients. If you don’t balance the soil, then your grass will not be able to live up to its potential. The things that you need to test for are nitrogen, phosphorus, pH, and potassium levels. You can purchase a kit at your local lawn care store as well as any necessary fertilizers. One of the most important things to do after you put down grass seed and the necessary nutrients is to water. Water around the same time every day so that the grass maintains a constant cycle. The best time to water is in the morning because it will be less likely to evaporate from the heat before it settles into the ground. It is recommended that you water your grass about one inch per week. If you are going to use a sprinkler, you can place a cup out to measure how much water is being spread on the grass. 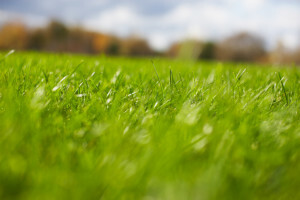 Mow your lawn one day after watering so that the grass isn’t damaged from being cut while dry. The grass takes a longer time to heal after being cut if hasn’t been recently watered. It doesn’t have to be soaking wet, which is why you can wait one day to mow. The grass just has to have enough water retained so that it can heal and prevent any brown tips. Also, when mowing, be sure not to cut the grass too short. Grass can burn from the sun if it is too short. It will also become more durable if it is high enough to save itself if it receives any damage. As a rule of thumb, don’t trim the grass any more than one third of its height. It is important to aerate your lawn. Aeration is the process of creating small holes in the soil to allow the water and nutrients to seep down to the roots. It causes you to be able to use less water and nutrients because it will be easily absorbed by the grass. Sometimes simply taking care of your lawn is not enough to maintain the most lush, green grass in the neighborhood. If you need assistance with your landscape care, be sure to contact Greener Horizon, LLC. We have plenty of professionals who would be able to make sure that you can get that green grass you’re looking for.